Check out this Houzz article with interior design trends for 2018. Some great ideas for designing your custom luxury home at Serosun Farms! Serosun Farms Swainson’s House was a featured home the the USGBC Green Built Home Tour. Check out the attached videos to learn about the green features from our very own John DeWald. Efficient design – An efficient design makes the best possible use of space and building materials, and reduces the ongoing need for energy and water in the operation of the home. Effective design – Effective design of the living space accommodates the lifestyle of the owners and creates a comfortable space in which to live. An effective design also optimizes the use of the home site and integrates sustainable components into the building’s design. Flexible design – Design in the home that is flexible to give it the ability to accommodate changes in the owner’s lifestyle and to adopt new technologies and approaches to sustainable building in the future. It is important to have the home design reviewed by green building experts and technology vendors to help ensure that the sustainable elements can be easily and successfully integrated into the home and that effective cost/benefit decisions have been made. Because our team has these experts, and because they have an established working relationship, we can do this quickly and efficiently. Beyond the initial design, the Builder plays a key role in successfully creating a sustainable home through its construction. Many of the most cost effective elements of a sustainable program revolve around good building practices, which we must rely on the builder to implement. The builder is also responsible for selecting and managing the core subcontractor trades that implement the many sustainable elements of the home. The builder and these trades must be educated and experienced with sustainable approaches, and must be able to work well with each other and with the vendors of the green products and technologies that are being integrated into the home. These subcontractors include the trades involved in site preparation, framing and carpentry, roofing, plumbing systems, electrical systems, and ducting. Our green team ensures builder and subcontractor awareness of our sustainability requirements and facilitates effective cooperation of all of the contributors. Our sustainable building partners, or Green Building Team, include a number of consultants, contractors and vendors that provide the expertise, technology, products, and services to implement the various sustainable elements of the home. It is important that these team members work closely with the architect, builder, and trades since these elements often require changes to traditional building practices, have to interact with multiple other elements of the home, and have special requirements which, if not appropriately addressed, may lower the performance of the home. Quality Control is important in ensuring that the systems are properly installed and functioning optimally. Testing, inspection and validation of construction work is important to ensure that the home systems are performing effectively. While this is generally a good building practice, it is critical in this instance to ensure that a high-performance home is working as it should. We require that a third party vendor reviews all design plans to evaluate the effectiveness of the design and its expected performance. We also require that a third party vendor inspects the implementation of the building elements, with onsite inspections during construction, and inspection and testing of the building at the completion of construction, to ensure that the building performs to expectations. A key factor in the success of a high performance home is its operation. Owners play an important role in the sustainable home by the choices they make in the design phase as well through the practices that they adopt in living in and maintaining their homes. At Serosun Farms we help ensure success of the homeowner through education and awareness, but also by making it easy to maintain each high-performance home. To get the most out of your high performance home you need to understand how to effectively set up and control its many features. We require that the builders educate the homeowner on how to operate, maintain, and maximize the benefits of each sustainable and high-performance element of their home. The home automation systems we require in our homes allow its green systems to be more easily controlled. Because many of the key elements and products are common among the homes on the Estate at Serosun Farms, our homeowners association can use master maintenance contracts to efficiently and cost effectively manage the ongoing inspection, operation, and maintenance of many of the home elements such as septic systems, water systems, geothermal systems, solar systems, and landscaping maintenance. 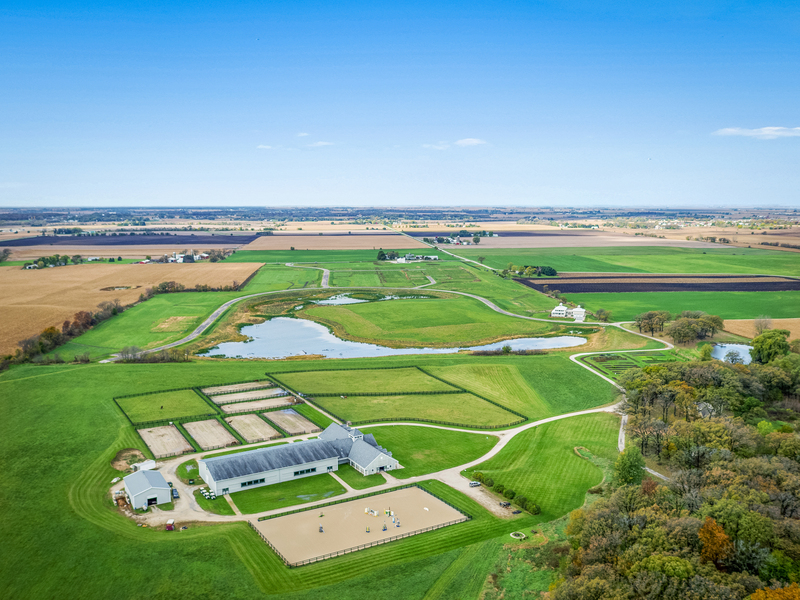 The Serosun Farms community is a farm estate with many residents living amongst a sustainable farm, equestrian center, and natural open space. The community is managed by the Estate, which controls the development and ultimate operation of the community and farm. Estate operations are managed by the Serosun Farms Estate Board and Estate Manager. The estate has a number of tools it uses to implement its sustainable programs. These include the Serosun Farms Sustainable Community Plan and its Green and Sustainable Building Plan. The estate controls the Estate and Residential CC&R’s as well as the Serosun Farms Design Guidelines, and it selects the Serosun Farms Design Review Committee that manages these guidelines. These CC&R’s and Design Guidelines control all building on the estate. The Design Review Committee reviews and approves the plans for all homes built on the estate and evaluates them for their adherence to the Design Guidelines. Through these guidelines the sustainable elements of the green building program are specified and goals are set for home performance. The Guidelines are flexible to allow for the ongoing advances in sustainable and high-performance home building technology. Sustainable home building is most successful when you have an integrated team designing and building the home. Serosun Farms has created a Green Building Team that is managed through a central program designed to provide the latest in tried and tested products and technology. This team includes Master Builders, architects, tradesman, and vendors who work together to design and build high-performance homes consistently and economically. They have been selected because they are the leading providers of these products and services in the Midwest and their products are both well designed and cost effective. Ask your sales person for a listing of the Serosun Farms Green Team members and the services, technologies, and products they provide. The Estate also has established the Serosun Farms Builders Council. The Builders Council drives the Green Building Program and the selection and management of the Green Building partners. The Builders Council also reviews and approves all builders that work on the estate. If a lot owner selects a builder that is not already part of the Preferred Builder Program at Serosun Farms, they must first be reviewed and approved by the Builder Council and understand and agree to the green building program at Serosun Farms. This ensures that all homes on the estate are completed by builders who can not only deliver homes with the level of quality expected, but who are also capable of adhering to the sustainable building program design elements and practices. Serosun Farms also utilizes several outside organizations for guidance, education, and support in its Green Building Program. These include the US Green Building Council and its LEED program, NAHB and its Green Build program, US EPA and its Energy Star Program, Conservation Foundation’s Conservation @ Home Program, and others. While we don’t require homes to be certified under these programs, their guidelines are very helpful and homes meeting the Serosun Farms Green Building Program requirements should meet their certification requirements at the highest levels. We will be building several homes over the course of the development that will be used not only as models, but also as homes that will demonstrate the ease of use and effectiveness of our sustainable building elements. These efforts will also help us to continue to develop and train our team, as well to provide an opportunity to try out new technology, techniques, and products to ensure that they meet our standards for performance and cost effectiveness. These models also will serve as educational centers for sustainable building practices. We believe that building high quality, high performance homes in a sustainable manner requires an integrated, systematic approach to the design, construction and operation of the home. Sustainable building should take a holistic look at the design and construction of a home and its impact– economically, environmentally, and culturally– on the community and its inhabitants, while at the same time satisfying the needs and lifestyle of its owners. Sustainable building really begins with the community and the setting to be created around the home. Once that is determined, the design, construction, and operation of the home need to be considered. While it can be a daunting process, if well understood it can be an enjoyable and rewarding experience. At Serosun Farms, we have done the homework for you already by creating a sustainable environment within which to build your home. We have researched various technologies and approaches to sustainable building and have recruited an integrated team of builders, architects, consultants, and vendors that make up our green team and green building program. We have created a road map for your journey to owning a sustainable home, have identified the technologies, building practices and products necessary to get there, and have put together a support team that will help smooth your way through what might otherwise be a maze of buzz words and details to your goal. Overall, we feel we have created an efficient, high-quality, and cost effective process. Design and construction starts with the selection of the team that will help you get there. At Serosun, our master builders and architects are experienced with designing and building high quality custom homes that include green and sustainable elements. Around them, we have built a team of contractors, consultants, and vendors who will provide the best in green technology and products for a high-performance, high-quality sustainable home. Our green team can help you evaluate your options and decide which technologies, approaches, and products are most appropriate for you. We have gathered a team of over 30 consultants, contractors and vendors that are the leading providers in the Chicago area. They have coordinated with each other, and with the builders and architects, to ensure product compatibility and effective implementation. As an added bonus, they are able to provide group buying discounts to Serosun homebuilders. With this team in place, we can now begin identifying the elements of sustainable home building that most appropriately reflect your goals and lifestyle. Once identified, we will help you understand how to evaluate, implement, and integrate those elements into a home that meets both your needs and Serosun Farm’s sustainable building requirements. There are a number of stages in the Serosun custom home design process that help guide our homeowners to create their dream home in a manageable, step-by-step way. Along the way, you will be supported by both our sales team and the architect/builder design team. Each stage may be done iteratively in order to help define what you want to achieve in your dream home, as well as help you refine that plan to fit into your budget. There may be a number of people on the owner’s team helping them through the process, but at a minimum, your sales representative, architect, and builder will be working with you. You may also engage our designers and landscape architects to help with the finished look of the property and its landscaping. The design process can take anywhere from 6 weeks to many months, depending on how many iterations are performed at each step, and how quickly you can decide on various items. The permitting and financing efforts can be done in parallel, and typically take 1.5 – 2 months, but there are several variables here that can affect the schedule. Once permitted, construction usually takes 6 – 12 months, depending on the size and complexity of the home, as well as the weather conditions at various stages in the construction process. It pays to start planning early, to ensure the home is completed by the time you want to move in. Once you decide that you want to live at Serosun, you enter the Pre-Design Stage. At this stage we try to help you understand how to best utilize the Serosun Design Process to your advantage while designing and building your home. We also start to create initial visions of what your home can be like here at Serosun. Our sales staff, builders, and architects will walk you through an informal question and answer process that will help you identify your lifestyles, wants, needs and dreams, in addition to understanding your constraints. We can then map out a path to realizing your dream home. During this stage, you select a lot. This pre-design work can help focus on the lots that best fit what you want in a home, or help your home fit the lot you choose. Once you go into contract on your lot, we can start the conceptualization of the design. At this point, you select an architect and a builder to work with, and execute contracts with them. During this stage, we begin to formalize your dream home and set it to paper, fitting your home to the lot you have selected, and to your lifestyle. A program is developed which identifies the elements of your home and how your needs are serviced by these elements – how many bedrooms, size of the master bedroom, elements of the kitchen, etc. We also analyze the lot to see what its key features are, how the home might fit on the lot, and relate it to its surroundings. We also start to arrange the home elements (both inside and outside) based on their orientation to the lot and farm, and how they fit your lifestyle, creating a very rudimentary floor plan. We begin “right-sizing the house,” making sure it makes sense in terms of your lifestyle and budget. For some, this might take a few iterations. Concept sketches are typically created at this time to give a perspective of how the house might look. The team during this stage typically includes the architect, the builder, and a landscape architect. At this point, we start to refine the floor plan and model the home in 3D in order to look at the “massing” of the home (the interplay of height, length, and width), roof lines, and orientation on the lot. This is the stage where we review how the house may look based on the floor plans and layout, and experiment with different massing and styles to see what best fits the home, the owners, and the site. We begin to look at some of the passive elements and energy systems that represent the sustainable elements of the home. Once this stage is completed, and we have a stable layout, we can start finalizing some of the details (Part 2, below). The key is to stabilize the floor plans so that we can effectively move through subsequent steps without having to change the home layout and do a lot of design rework. At this point, it may be useful to provide preliminary drawings to the Estate Design Review Board and the County, to make sure that the home will work within the Estate Design Guidelines and the County Building Permit Process. We now look at the finer details of the floor plan, massing, and exterior trim, to finalize the look and feel of the home. We start to incorporate decisions on many of the home’s sustainable elements, such as framing and insulation systems, energy systems, water systems, exterior trim and finishes, and landscaping elements. We now create the final floor plans, elevations, and perspectives, to communicate the vision for the home. At this point, we again look at the budget, refining earlier decisions regarding the scope and size of the home, as well as the types of systems in the home, to adjust them to the homeowner’s goals. At this point, we work on the many finish details of the home, including kitchen and bath designs, colors and finish materials, lighting and plumbing fixtures, etc., allowing us to the finalize details regarding the many systems in the home. We start to create energy and water usage models, and make decisions that tune major systems such as HVAC, lighting and electrical, water systems, and appliances. The designer and landscape architect may help the owner navigate through the multitudes of finishes and fixtures that are out there, and to help refine the look and feel the owner wants to achieve inside and out. Detailed cost analyses can now be made, and design decisions adjusted to meet budget. At this point, the builder takes the lead as we focus on planning, permitting, financing, and construction startup. The architect creates construction documents, and the builder starts the permitting process with the County. The final engineering for the site is completed, and final budgets and drawings for the bank are prepared. Final plans are presented to the Estate Design Review Board for final approvals. If you are interested in getting LEED, NAHB Green Building, or other certifications, the plans are reviewed once more for conformance to those programs. Plans and schedules for construction are worked out, and home construction starts once permits are ready and financing is in place. While the home is being built, you will go on several inspection walks with the architect to review progress. Once the home begins to take shape, there may be instances where you decide to change some elements of the design. This is not unexpected, as you begin to see the full three-dimensional home emerge. Changes at this stage of the process generally increase the cost of the home, which is why we spend so much time in the earlier stages of the design process attempting to reduce the likelihood of late changes. During construction, the home will be inspected by the County building inspector, as well as any third-party certification programs, such as LEED. Once completed, the home is given a final inspection, and the owner can move in and start their life at Serosun. Custom home building can be a challenging undertaking to manage and orchestrate by yourself. Add in all the great tech­nology and complex systems that sustainable, high-performance homes bring to the table, and it can easily seem like an overwhelming task. There are many potential obstacles during the building process and potential pitfalls that might arise down the road if things aren’t managed properly. A homeowner will often work sequentially with an architect to design their home, then bid out the plans to a multiple builders, and then engage a builder along with various vendors and subcontractors to complete the project. If the plans become too complex, or construction costs go beyond budget, the homeowner may have to go back through the design process many more times until they are happy with the design and it falls within their price range. Once they start construction, homeowners often find that many of the systems specified don’t quite work the way they had planned, requiring another round of redesign. You can simplify things by going with a builder’s pre-packaged “semi-custom” home design, but you lose many of the great benefits of designing and building a true custom home that was meant specifically for you and for the place where you are intending to build it. You don’t get the full flexibility to really design and build your own dream home. At Serosun, we believe that a true custom home meant for you is attainable without all of the challenges of taking it on by yourself. We have crafted a process and assembled a team to help you achieve that great design, and to provide the ultimate home-building experience for you through our “custom build process.” Our process brings the entire team together to focus on de­sign, budget, sustainability and performance all at once. The value of having a collaborative team of architects, builders, vendors and contractors available to you, is that you get to leverage the experience and insights of the best in those areas while de­signing and building your home. By having the builder and our other partners involved as part of the early design process, we help keep the design within budget, keep all the systems coordinated to minimize issues during construction, and help to get the most out of the operation of those systems. The value of a collaborative team cannot be underestimated in building a home, and particularly in building a sustainable, high-performance home. At Serosun, we make sure that our sales team, customer support team, architects, builders, con­tractors and vendors build close relationships, and we test them out on our model homes. We ensure that everyone on the team understands our goals, participates in the design process, and provides feedback so we can effectively in­tegrate their building elements into the home. We also ensure that we are applying the best building techniques and products in the most economical way. A quality, high-performance home is one that exceeds local building codes. Simply passing local building inspections does not guarantee a quality home — a typical misconception regarding home quality. Passing building codes generally means that a home meets the minimum requirements for life safety and energy efficiency, but municipal inspectors do not indicate a degree of quality in their evaluations. The only stamp of quality that exists for homes are third party verified, quality certifications. These certifications are offered by groups such as the US Green Building Council through the LEED for Homes program, or the National Association of Home Builders through their Green Building Program. These certifications use the whole home system approach to building. This is based on an understanding of the interrelationships between different components of the home, and how one part of a home will affect all the others in your particular climate. A home is seen not just as a loose collection of individual components, but rather systems and parts that work together to achieve a symbiotic goal. This approach also looks at how you and your lifestyle affect all of the systems in the home. Elements that are considered for certification include: energy efficiency, water efficiency, materials selection, durability, indoor air quality, and others. These certifications look at a whole range of elements in the home design and construction, and use a point system to provide a score indicative of the level of quality and sustainability of the home. They identify a series of levels that a home can achieve such as: Certified, Silver, Gold, and Platinum. Homes at Serosun that meet the design guidelines will typically qualify under these ratings systems. There are other more specific ratings systems that also may also be considered, including the EPA Energy Star Program, which is focused on energy efficiency, and the American Lung Association Healthy Homes Program, which is focused on indoor air quality. These certifications will cost the home owner some money for the inspections and paper work, but can be well worth their while as they provide third party documentation on the quality and sustainability of the home – verifications that may be valuable at the time of resale. They may also be valuable for the homeowner’s own peace of mind by providing the assurance that their home meets these quality criteria.